Based on a real life serial killer, will this 1971 film offer the same amount of terror as on original release? John Christie, a middle aged man who lives a quiet life with his wife, holds a secret: he has been murdering women for the last ten years. When a young family arrive to rent the top floor of Christie’s house he can’t resist attempting another murder. Richard Attenborough, best known previously as the angry youthful gangster Pinkie Brown in Brighton Rock, plays the central character, John Christie. Attenborough displays Christie as a softly spoken and seemingly considerate neighbour who unnerves characters at every step. He creates a brilliantly calming persona and can wander into a conflict, dispel it and take authority with no more than a whisper and the use of vague legal or medical terms. It is extremely hard to watch and remarkably shocking, even forty plus years on. Hurt plays an illiterate working man who has a habit of exaggerating his abilities, income and family descent to impress the people around him and with Christie living below him he plays an unknowingly dangerous game. Hurt is fantastic in this role transforming believably into an easily lead and hopeless individual. He’s surprisingly charismatic bringing a lot of warmth, passion and emotional understanding to a character that could so easily have been written off as a dithering fool. In 10 Rillington Place, director Richard Fleischer has created a slow paced thriller that takes it’s time with every scene, even the action itself. The murder scenes are harrowing with drawn out shots using steady cam and extreme close ups to bring the viewer into the scene. Fleischer allows no escape from the horror of Christie’s acts and it is this relentless use of camerawork along with Attenborough’s portrayal which makes 10 Rillington Place one of the very best films to portray a serial killer. 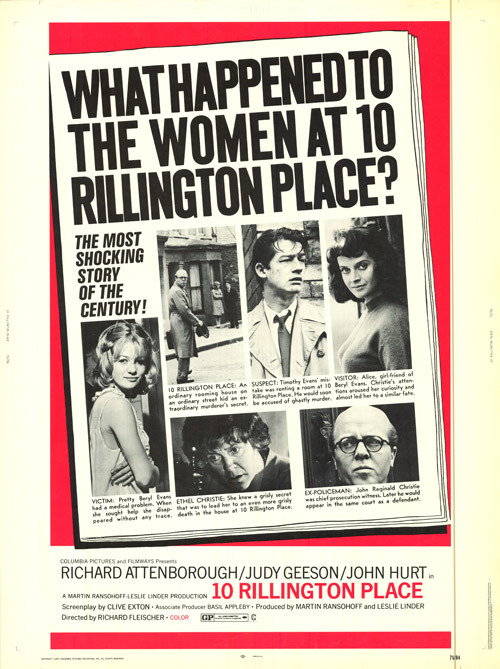 With an uncompromising direction and excellent cast, 10 Rillington Place is a film which will unnerve and shock even today’s audiences.